Have a schedule of events that you would like to share with other staff and parents? 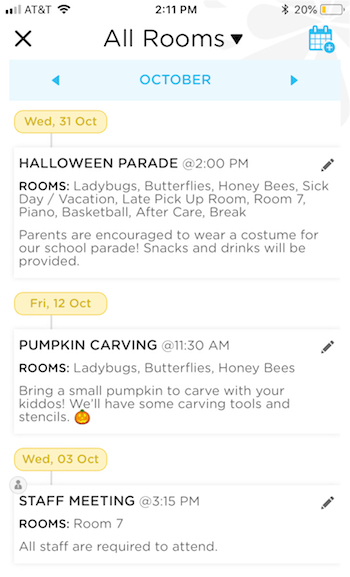 Kinderlime makes it easy with our calendar feature. This feature is available for both staff and administrators, and is an app-only feature at this time. 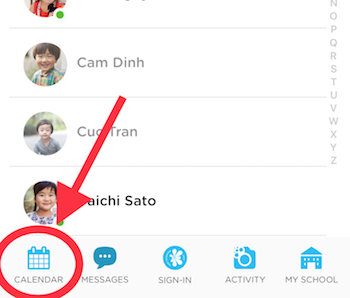 To schedule an event, open the Kinderlime app and select the calendar icon in the lower left. Click on the calendar icon again in the upper right to create a new event. 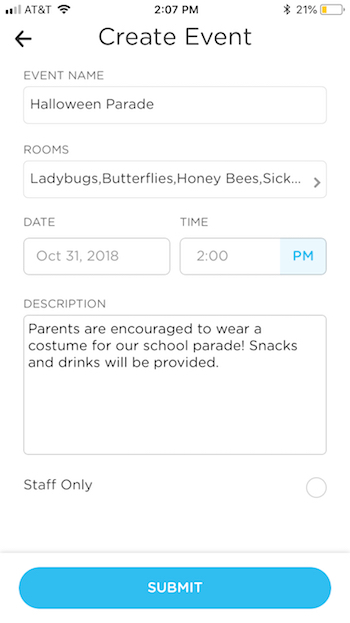 Note that you can mark the event as "Staff Only" to hide the event from the parents' view. 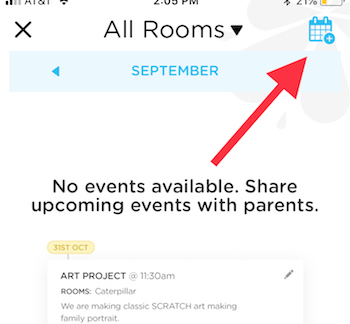 NOTE: If you do not select "Staff Only," parents can open their app at any time and click on the calendar icon to view the events you have scheduled. When you hit submit, you will be asked if you would like to notify the parents of the event. Saying "Yes, Notify" will send a push notification to parents regarding the event you have created. Once you have created your events, they will appear in reverse chronological order for the month (ie, events happening at the end of the month will appear at the top of the screen, while events happening in the beginning of the month will appear toward the bottom). "Staff Only" events will have a little gray person symbol in the corner (as you can see above). All events can still be edited by clicking on the pencil icon after they are created.